Imprint Method: Sand Carve - Offer up a sleek and stylish accolade to your deserving employees. Our popular Jade Square Crescent Award is now available! 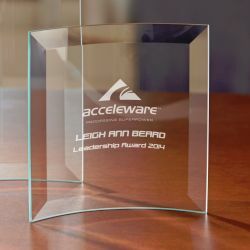 This award features clear glass with a dazzling hint of jade coloring and is perfect for handing out at banquets, receptions, fundraisers and other employee recognition ceremonies. Customize with your company name and logo, event and award titles and more to create a unique keepsake. Size: 5 " x 5 " x 0.25 "
Imprint Size:3.5" x 3.5", 3.25" x 3.25"